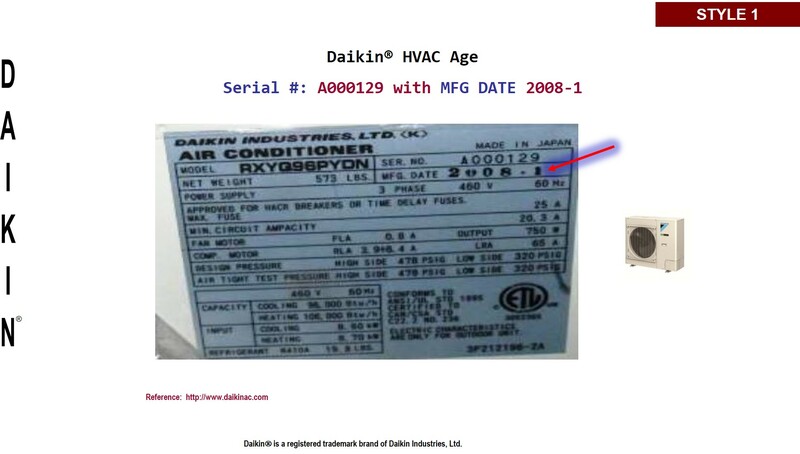 How to determine the date of production/manufacture or age of DAIKINl® HVAC Systems. 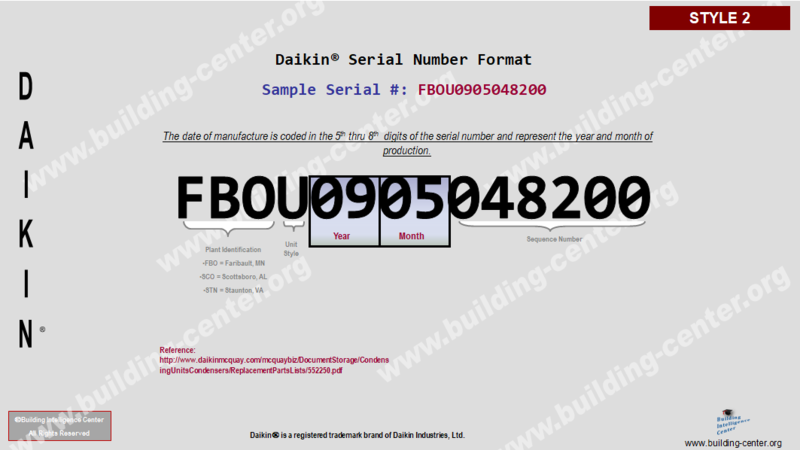 The date of production/manufacture or age of DAIKIN® HVAC equipment can be determined from the serial number or MFG. 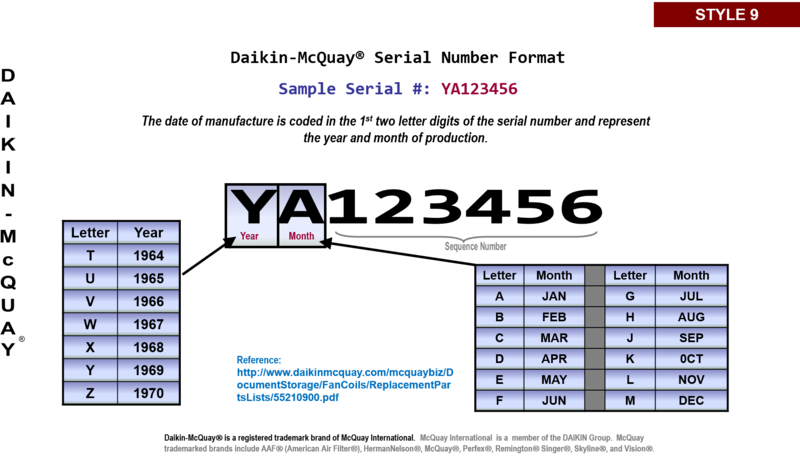 DATE located on the data plate. 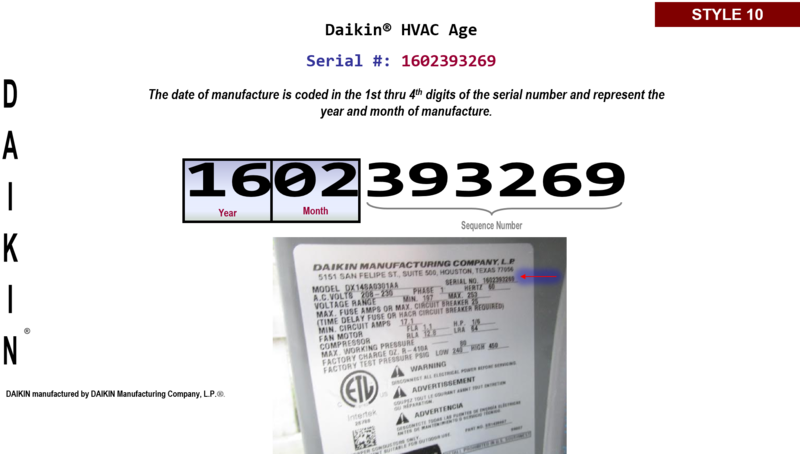 The date of manufacture is coded in the MFG DATE and represents the year and month of manufacture. 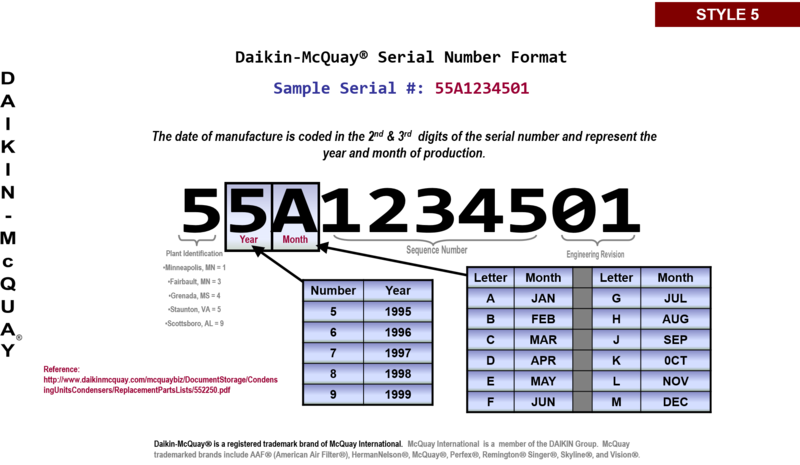 The date of manufacture is coded in the 5th thru 8th digits of the serial number and represents the year and month of manufacture. 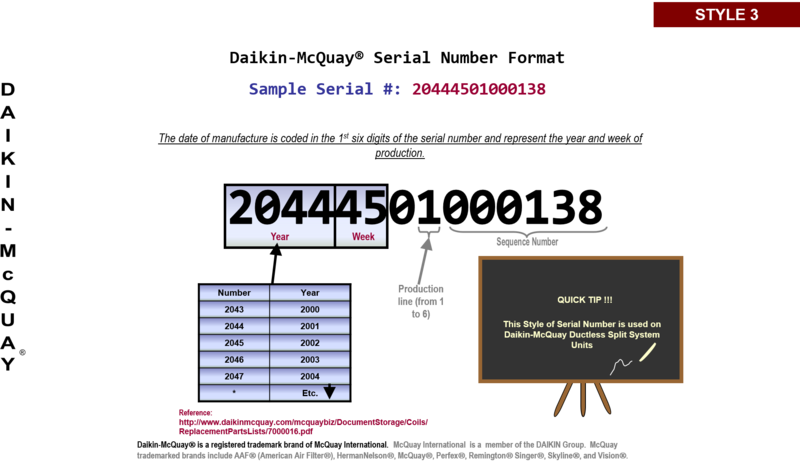 The date of manufacture is coded in the 1st six digits of the serial number and represents the year and week of manufacture. The date of manufacture is coded in the 3rd thru 5th digits of the serial number and represents the year and week of manufacture. The date of manufacture is coded in the 1st & 2nd digits of the serial number and represents the year and month of manufacture. This style of serial number was used during the period of 1995 thru 1999. 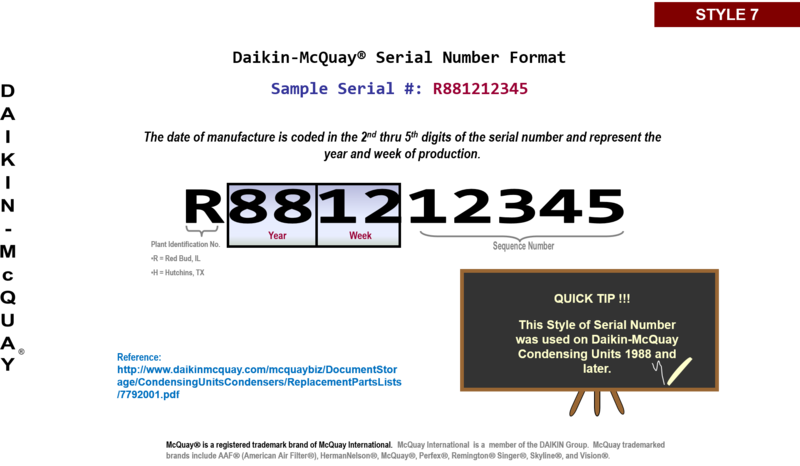 The date of manufacture is coded in the 2nd & 3rd digits of the serial number and represents the year and month of manufacture. This style of serial number was used during the period of 1971 thru 1994. 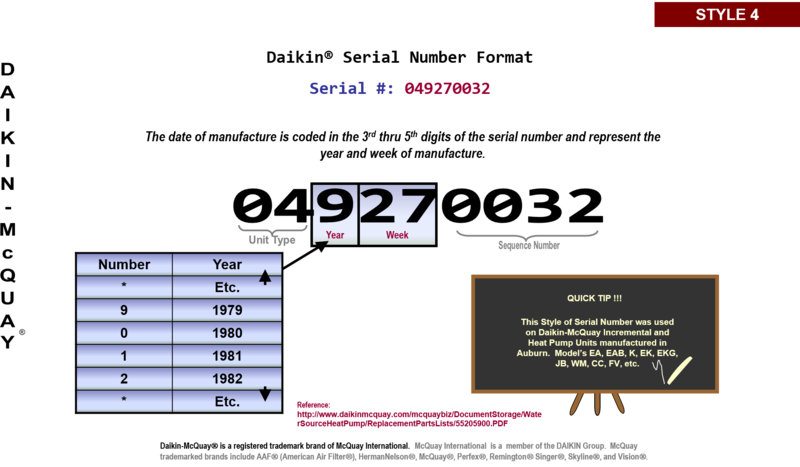 The date of manufacture is coded in the 2nd thru 5th digits of the serial number and represents the year and week of manufacture. 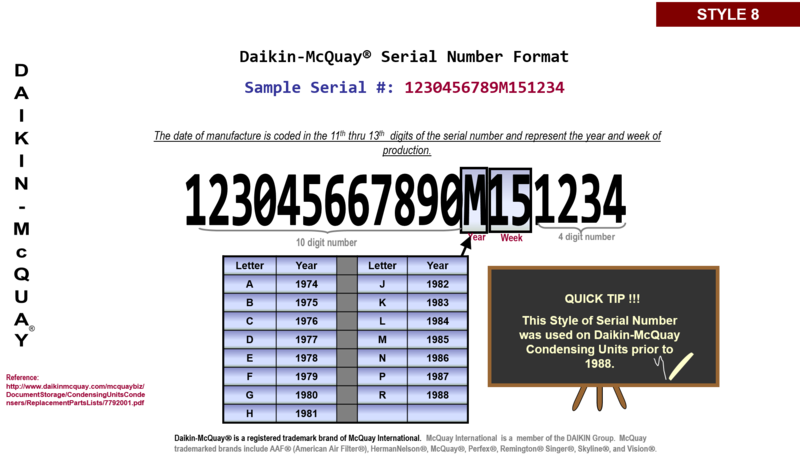 The date of manufacture is coded in the 11th thru 13th digits (the only letter in the serial number followed by two numerical digits) of the serial number and represents the year and week of manufacture. The date of manufacture is coded in the 1st two letter digits of the serial number and represents the year and month of manufacture. This style of serial number was used during the period of 1964 thru 1970. 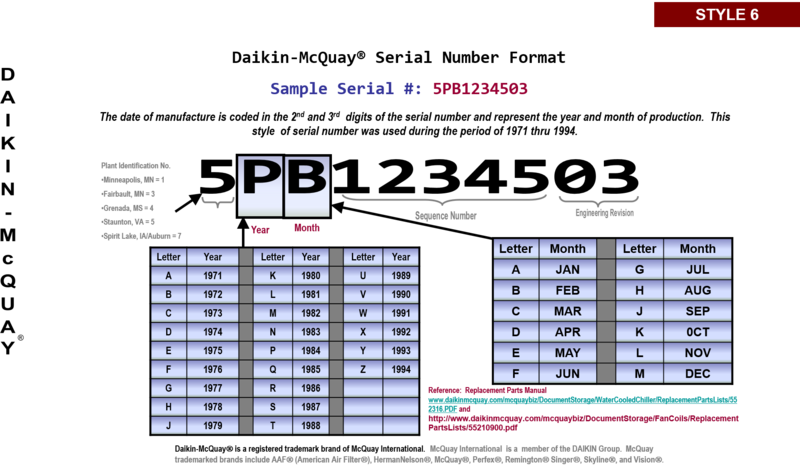 The date of manufacture is coded in the 1st thru 4th digits of the serial number and represents the year and month of manufacture.